How do we reconstruct long-term CO2 concentrations? How do we measure or estimate CO2 emissions? This article was first published in May 2017; however, its contents are frequently updated with the latest data and research. Since the Industrial Revolution, however, energy-driven consumption of fossil fuels has led to a rapid increase in CO2 emissions, disrupting the global carbon cycle and leading to a planetary warming impact. Global warming and a changing climate have a range of potential ecological, physical and health impacts, including extreme weather events (such as floods, droughts, storms, and heatwaves); sea-level rise; altered crop growth; and disrupted water systems. The most extensive source of analysis on the potential impacts of climatic change can be found in the 5th Intergovernmental Panel on Climate Change (IPCC) report; this presents full coverage of all impacts in its chapter on Impacts, Adaptation, and Vulnerability.2 In light of this evidence, UN member parties have set a target of limiting average warming to 2 degrees celsius above pre-industrial temperatures. This entry provides a historical to present day perspective of how CO2 emissions have evolved, how emissions are distributed, and the key factors that both drive these trends and hold the key to mitigating climate change. To set the scene, let&apos;s briefly look at how the planet has warmed — particularly since the Industrial Revolution. In the chart below the x-axis shows the time spanning 1850 to 2017. On the y-axis, we see the global average temperature rise above or below the 1961-1990 baseline temperature. This means that we use the average temperature over the 1961-1990 period as a baseline against which yearly changes in temperature are measured. The red line represents the average annual temperature trend through time, with upper and lower confidence intervals (the possible upper and lower range) shown in light grey. We see that over the last few decades, temperatures have risen sharply at the global level — to approximately 0.8 degrees celsius higher than our 1961-1990 baseline. When extended back to 1850, we see that temperatures then were a further 0.4 degrees colder than they were in our 1961-1990 baseline. Overall, if we look at the total temperature increase since pre-industrial times, this therefore amounts to approximately 1.2 degrees celcius. We have now surpassed the one-degree mark, an important marker as it brings us more than halfway to the global limit of keeping warming below two degrees celsius. If we extend our timeline back to 1750 and total up how much CO2 each country has emitted to date, we calculate each nation’s ‘cumulative emissions’. In the chart below, we have plotted the cumulative emissions of each nation through time from the industrial revolution in 1750 to 2016. The UK was the world’s first industrial-scale CO2 emitter. Emissions in other European countries and North America shortly followed and produced CO2 over the majority of this time period. Other regions—Latin America, Asia and Africa—started contributing to global CO2 emissions much later, largely contained to the 20th and 21st centuries. If we fast-forward to the accumulated totals we see today, the US and Europe dominate in terms of cumulative emissions. China’s rapid growth in emissions over the last few decades now makes it the world’s second largest cumulative emitter, although it still comes in at less than 50% of the US total. In the chart below we see this measure of cumulative CO2 emissions given as the share of the global total. Here we see even more clearly, the significant transitions and shifts in global emissions which have occurred. For most of the 19th century, global cumulative emissions were dominated by Europe: firstly in the United Kingdom, then to other countries in the (now) European Union. If we forget the cumulative time dimension and focus only on annual emissions, how do more recent annual emission trends compare? In the chart below, we can view annual CO2 emissions by country. You can select a range of countries to compare through time in the "chart" tab, or alternatively click on a country on the "map" tab to see its time series. In support of the cumulative chart we explored above, we can see that the annual trends of European and North American nations have grown much earlier than in other regions. Emissions from a number of growing economies have been increasing rapidly over the last few decades. Fast-forwarding to annual emissions in 2014, we can see that a number of low to middle income nations are now within the top global emitters. In fact, China is now the largest emitter, followed by (in order) the US, EU-28, India, Russia, Indonesia, Brazil, Japan, Canada and Mexico. Note that a number of nations that are already top emitters are likely to continue to increase emissions as they undergo development. In contrast to CO2 emissions growth in low to middle income economies, trends across many high income nations have stabilized, and in several cases decreased in recent decades. Despite this downward trend across some nations, emissions growth in transitioning economies dominates the global trend—as such, global annual emissions have continued to increase over this period. In the chart below we see each country&apos;s share of global CO2 emissions from 1751 through to 2016. This is calculated by dividing each country&apos;s emissions divided by the sum of all countries&apos; emissions in a given year. This doesn&apos;t include emissions from international aviation and shipping (so-called &apos;bunkers&apos;) and &apos;statistical differences&apos;. The key drawback of measuring the total national emissions is that it takes no account of the nation&apos;s population size. China is currently the world’s largest emitter, but since it also has the largest population, all being equal we would expect this to be the case. To make a fair comparison of contributions, we have to therefore compare emissions in terms of CO2 emitted per person. In the map below we compare CO2 emissions per capita through time since 1950. Again, if we cycle through time by moving the slider below the map, we see that per capita emissions in most countries have continued to increase in line with development. However, if we look at the distribution of per capita emissions in 2014, large global inequalities remain. Note that carbon dioxide is not the only greenhouse gas which contributes to climate change—nitrous oxide and methane are also greenhouse gases, but are not included here. Food production, especially intensive livestock-rearing for meat and dairy, is a major contributor to both of these non-CO2 GHGs. Since capita meat intake is strongly linked to GDP levels, per capita emissions of nitrous oxide and methane tend to be much larger in high-income nations. Therefore, if these gases were included alongside CO2, the global inequalities would be even higher. With a few exceptions, there is an important north-south divide in terms of per capita emissions. Most nations across sub-Saharan Africa, South America and South Asia have per capita emissions below five tonnes per year (many have less than 1-2 tonnes). This contrasts with the global north where emissions are typically above five tonnes per person (with North America above 15 tonnes). The monthly emissions per capita in rich countries are mostly higher than the yearly emissions per capita in poorer countries. The largest emitter, Qatar, has per capita emissions of 50 tonnes per year (1243 times that of Chad, the lowest emitter). Carbon dioxide emissions associated with energy and industrial production can come from a range of fuel types. The contribution of each of these sources has changed significantly through time, and still shows large differences by region. In the chart below we see the absolute and relative contribution of CO2 emissions by source, differentiated between gas, liquid (i.e. oil), solid (coal and biomass), flaring, and cement production. At a global level we see that early industrialisation was dominated by the use of solid fuel—this is best observed by switching to the &apos;relative&apos; view in the chart. Coal-fired power at an industrial-scale was the first to emerge in Europe and North America during the 1700s. It wasn’t until the late 1800s that we begin to see a growth in emissions from oil and gas production. Another century passed before emissions from flaring and cement production began. In the present day, solid and liquid fuel dominate, although contributions from gas production are also notable. Cement and flaring at the global level remain comparably small. You can also view these trends across global regions in the chart below, by clicking on &apos;change region&apos;. The trends vary significantly by region. Overall patterns across Europe and North America are similar: early industrialisation began through solid fuel consumption, however, through time this energy mix has diversified. Today, CO2 emissions are spread fairly equally between coal, oil and gas. In contrast, Latin America and the Caribbean’s emissions have historically been and remain a product of liquid fuel—even in the early stages of development coal consumption was small.4 Asia’s energy remains dominant in solid fuel consumption, and has notably higher cement contributions relative to other regions.5 Africa also has more notable emissions from cement and flaring; however, its key sources of emissions are a diverse mix between solid, liquid and gas. Which is the largest contributor to carbon dioxide emissions — transport or electricity, residential or manufacturing? In the chart below we see the share of CO2 emissions from fuel combustion derived from each sector. Globally around half of global emissions were the result of electricity and heat production in 2014. Transport and manufacturing industries both contributed approximately 20 percent; residential, commercial and public services around 9 percent and other sectors contributing 1 to 2 percent. The visualisation below presents the long-run perspective on global CO2 emissions. Global emissions increased from 2 billion tonnes of carbon dioxide in 1900 to over 36 billion tonnes 115 years later. 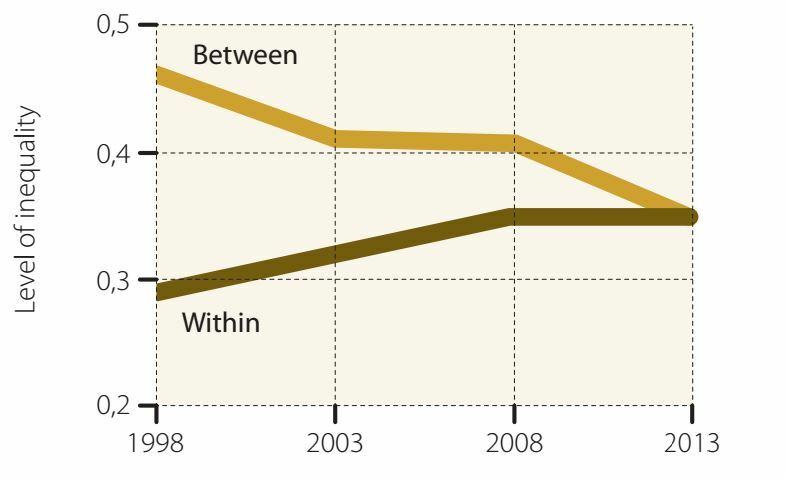 What do our most recent trends in emissions and concentrations look like? Are we making any progress in reduction? Whilst data from 2014 to 2017 suggested global annual emissions of CO2 had approximately stabilized, the most recent (preliminary) data from the Global Carbon Project reported a 2.7 percent increase in 2018. The chart below shows cumulative emissions of CO2 by region. This is given as the cumulative emissions since 1751, and is based on territorial (production-based) accounting, meaning it does not account for emissions embedded in trade. The large growth in global CO2 emissions has had a significant impact on the concentrations of CO2 in Earth’s atmosphere. If we look at atmospheric concentrations over the past 2000 years (see the Data Quality and Measurement section in this entry for explanation on how we estimate historical emissions), we see that levels were fairly stable at 270-285 parts per million (ppm) until the 18th century. Since the Industrial Revolution, global CO2 concentrations have been increasing rapidly. However, CO2 is not the only GHG we’re concerned about—emissions of nitrous oxide (N2O) and methane (CH4) have also been increasing rapidly through agricultural, energy, and industrial sources. Like CO2, the atmospheric concentration of both of these gases has also been rising rapidly. Has a global stabilization of CO2 emissions over the last few years had an impact on global atmospheric concentrations? While it appears progress is being made on global emissions, atmospheric concentrations continue to rise, as shown below. Atmospheric concentrations have now broken the 400ppm threshold—considered its highest level in the last three million years. To begin to stabilise—or even reduce—atmospheric CO2 concentrations, our emissions need to not only stabilise but also decrease significantly. Carbon dioxide is not the only greenhouse gas of concern for global warming and climatic change. There are a range of greenhouse gases, which include methane, nitrous oxide, and a range of smaller concentration trace gases such as the so-called group of &apos;F-gases&apos;. In the chart below we see the GWP100 value of key greenhouse gases relative to carbon dioxide. The GWP100 metric measures the relative warming impact one molecule or unit mass of a greenhouse gas relative to carbon dioxide over a 100-year timescale. For example, one tonne of methane would have 28 times the warming impact of tonne of carbon dioxide over a 100-year period. GWP100 values are used to combine greenhouse gases into a single metric of emissions called carbon dioxide equivalents (CO2e). CO2e is derived by multiplying the mass of emissions of a specific greenhouse gas by its equivalent GWP100 factor. The sum of all gases in their CO2e form provide a measure of total greenhouse gas emissions. In the chart below, we see the contribution of different gases to total greenhouse gas emissions. These are measured based on their carbon-dioxide equivalent values (as explained in the section above). Overall we see that carbon dioxide accounts for around three-quarters of total greenhouse gas emissions. However, both methane and nitrous oxide are also important sources, accounting for around 17 and 7 percent of emissions, respectively. Collectively, HFC, PFC and SF6 are known as the &apos;F-gases&apos;. Despite having a very strong warming impact per unit mass (i.e. a high global warming potential), these gases are emitted in very small quantities; they therefore make only a small contribution to total warming. Energy (energy, manufacturing and construction industries and fugitive emissions): emissions are inclusive of public heat and electricity production; other energy industries; fugitive emissions from solid fuels, oil and gas, manufacturing industries and construction. Transport: domestic aviation, road transportation, rail transportation, domestic navigation, other transportation. International bunkers: international aviation; international navigation/shipping. Residential, commercial, institutional and AFF: Residential and other sectors. Industry (industrial processes and product use): production of minerals, chemicals, metals, pulp/paper/food/drink, halocarbons, refrigeration and air conditioning; aerosols and solvents; semicondutor/electronics manufacture; electrical equipment. Waste: solid waste disposal; wastewater handling; waste incineration; other waste handling. Agriculture: methane and nitrous oxide emissions from enteric fermentation; manure management; rice cultivation; synthetic fertilizers; manure applied to soils; manure left on pasture; crop residues; burning crop residues, savanna and cultivation of organic soils. Land use: emissions from the net conversion of forest; cropland; grassland and burning biomass for agriculture or other uses. Other sources: fossil fuel fires; indirect nitrous oxide from non-agricultural NOx and ammonia; other anthropogenic sources. Total greenhouse gas emissions (measured in their carbon-dioxide equivalent values) by sector are shown in the chart below. The combined figures for agriculture, forestry and land use yield a similar result to that of the IPCC: collectively these emissions account for approximately one-quarter of global emissions. Agricultural land often expands into previously forested areas, and this process of deforestation releases CO2 stored in trees and soils. These emissions are included in the accounting related to agriculture, forestry and land use (ALOFU), and it is estimated that up to 80 percent of deforestation is the result of agricultural expansion. Secondly, global economic growth has not only resulted in an increase in food demand (richer people tend to eat more), but also in changes in dietary composition; that is, changes in what we eat. Economic growth is typically related to an increase in meat consumption.12 Livestock are an important source of greenhouse gas emissions, with variations between animal products (lamb and beef are usually the most carbon-intensive and chicken the least).13 A growing global middle class has led to significant increases in global meat consumption in recent decades—trends in meat consumption can be found at our entry on Meat and Seafood Production & Consumption. National pledges: if all countries achieve their current targets/pledges set within the Paris climate agreement, it&apos;s estimated average warming by 2100 will be 2.6-3.2°C. This will go well beyond the overall target of the Paris Agreement to keep warming "well below 2°C". 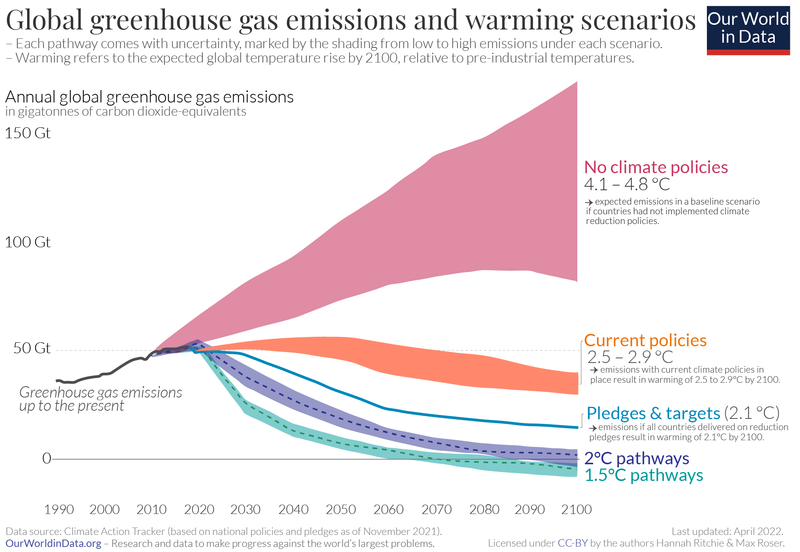 2°C consistent: there are a range of emissions pathways that would be compatible with limiting average warming to 2°C by 2100. This would require a significant increase in ambition of the current pledges within the Paris Agreement. Historically, CO2 emissions have been primarily driven by increasing fuel consumption. This energy driver has been, and continues to be, a fundamental pillar of economic growth and poverty alleviation. As a result, we see in the visualization below that there is a strong correlation between per capita CO2 emissions and GDP per capita. This correlation is also present over time: Countries begin in the bottom-left of the chart at low CO2 and low GDP, and move upwards and to the right. Historically, where fossil fuels are the dominant form of energy, we therefore see increased CO2 emissions as an unintended consequence of development and economic prosperity. While we see this general relationship between CO2 and GDP, there are outliers in this correlation, and important differences exist in the rate with which per capita emissions have been growing. These differences are exemplified in global inequalities in energy provision, CO2 emissions, and economic disparities. In the chart below we see the change in CO2 emissions (i.e. the growth rates) over the last few decades (1998-2013) across the global spectrum of emitters. On the x-axis we have the spectrum of global emitters (where those at the far left have very low per capita emissions, and those at the far right have the world&apos;s highest per capita emissions). On the y-axis we have the growth (in %) in CO2 emissions that each segment of emitters has undergone from 1998-2013. We see that the middle of the spectrum—typically those near the middle of the global income spectrum—have experienced a large growth in CO2 emissions over the last few decades (most between 25-40%). Insofar as emissions are a correlate of development, this is good news and reflects the fact that a global middle class is developing, but it does present important challenges in terms of global CO2 emissions. It is therefore concerning that at the bottom of the spectrum (the group of people of whom many are part of the world&apos;s poorer population) have seen a 12% decline in CO2 emissions over this same period. While a decline in emissions is necessary and possible for individuals with high per capita emissions, for the poorest, this potentially suggests stagnation or decline in living conditions. Not only cross-country inequalities in CO2 emissions are important—there are also noticeable within-country inequalities. In fact, as the global inequalities in CO2 emissions between countries begin to converge, within-country inequalities become more important. As the chart below shows, in 1998 two-thirds of inequality in CO2 emissions were due to between-country differences. Within-country differences then became more important, and by 2013, within and between-country differences were responsible for roughly the same share of total inequalities. The link between economic growth and CO2 described above raises an important question: do we actually want the emissions of low-income countries to grow despite trying to reduce global emissions? In our historical and current energy system (which has been primarily built on fossil fuels), CO2 emissions have been an almost unavoidable consequence of the energy access necessary for development and poverty alleviation. In an ideal world, this energy could be provided through 100% renewable energy: in such a world, CO2 emissions could be an avoidable consequence of development. However, currently we would expect that some of this energy access will have to come from fossil fuel consumption (although potentially with a higher mix of renewables than older industrial economies). Therefore, although the global challenge is to reduce emissions, some growth in per capita emissions from the world&apos;s poorest countries remains a sign of progress in terms of changing living conditions and poverty alleviation. Energy efficiency: the amount of energy needed for one unit of GDP output. This is often related to productivity and technology efficiency, but can also be related to the type of economic activity underpinning output. If a country&apos;s economy transitions from manufacturing to service-based output, less energy is needed in production, therefore less energy is used per unit of GDP. Carbon efficiency: the amount of CO2 emitted per unit energy (grams of CO2 emitted per kilowatt-hour). This is largely related to a country&apos;s energy mix. An economy powered by coal-fired energy will produce higher CO2 emissions per unit of energy versus an energy system with a high percentage of renewable energy. As economies increase their share of renewable capacity, efficiency improves and the amount of CO2 emitted per unit energy falls. In the chart below, we see that the global CO2 intensity has been steadily falling since 1990.17 This is likely thanks to both improved energy and technology efficiency, and increases in the capacity of renewables.18 The carbon intensity of nearly all national economies has also fallen in recent decades. Today, we see the highest intensities in Asia, Eastern Europe, and South Africa. This is likely to be a compounded effect of coal-dominated energy systems and heavily industrialized economies. The shift in industrial production from high-income to transitioning economies, and its impact on CO2 emissions, is discussed in the next section. Although carbon intensities have generally shown a steady, gradual decline in recent decades, dramatic short-term fluctuations in intensity can occur and are typically the result of significant short-term political or economic change. The most dramatic example of this was seen in China during its &apos;Great Leap Forward&apos; campaign in the 1950s-60s, which we have explored in detail on our blog here. 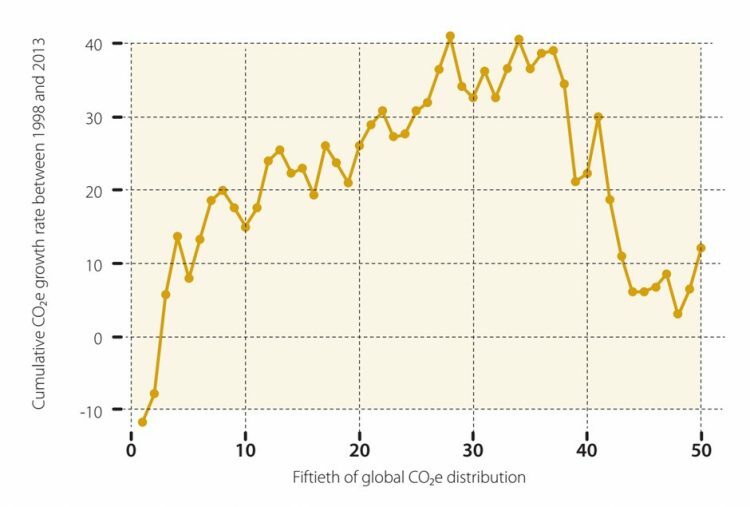 As seen in the section above, the general trend in carbon intensity at the global and national level is a downward trend over time. But how do levels of CO2 intensity change across different levels of prosperity? In the chart below we have plotted average carbon intensities by country (y-axis) against gross domestic product (GDP) per capita (x-axis, log scale). As a cross-section across countries in any given year, we see an overall shape akin to an inverted-U. On average, we see low carbon intensities at low incomes; carbon intensity rises as countries transition from low-to-middle incomes, especially in rapidly growing industrial economies; and as countries move towards higher incomes, carbon intensity falls again. This trend is approximately true as a cross-section across countries. However, such trends differ for individual countries over time. If we view these trends over the timeline from 1990 onwards we see that there are large variations in the evolution of carbon intensities, even for countries with similar income levels. CO2 emissions are most typically measured and reported in terms of CO2 "production". This accounting method is also sometimes referred to as "territorial-based" emissions because it reports emissions as those emitted within a country&apos;s given geographical boundaries. As a result, this method takes no account of emissions which may be imported or exported in the form of traded goods.19 "Consumption-based" accounting adjusts CO2 emissions for this trade of emissions and more accurately reflects the emissions necessary to support a given country&apos;s way of living. What does a global map of traded CO2 emissions look like? In the map below we see the net emissions transferred between countries as a percentage of their domestic production emissions [you can also view these trends in absolute terms here]. The net emissions transfers here is the CO2 embedded in imported goods minus the CO2 embedded in exported goods. This tells us whether a country is a net exporter or importer of emissions. In our chart, positive values (red) indicate a country is a net importer of emissions, and negative values (blue) represent net exporters. Here we see an important East-to-West relation, with large exports from Asia and Eastern Europe into Western Europe and North America. In other words: some of the CO2 produced (and reported) in emission records of Asian and Eastern European countries is for the production of goods consumed in Western Europe and North America. Based on the updated data gathered by Peters et al. (2012) and the Global Carbon Project20, if we switched to a consumption-based reporting system (which corrects for this trade), in 2014 the annual CO2 emissions of many European economies would increase by more than 30% (the UK by 38%; Sweden by 66%; and Belgium&apos;s emissions would nearly double); and the USA&apos;s emissions would increase by 7%. On the other hand, China&apos;s emissions would decrease by 13%; India&apos;s by 9%; Russia&apos;s by 14% and South Africa by 29%. The composition of this trade is also important in terms of carbon intensity. 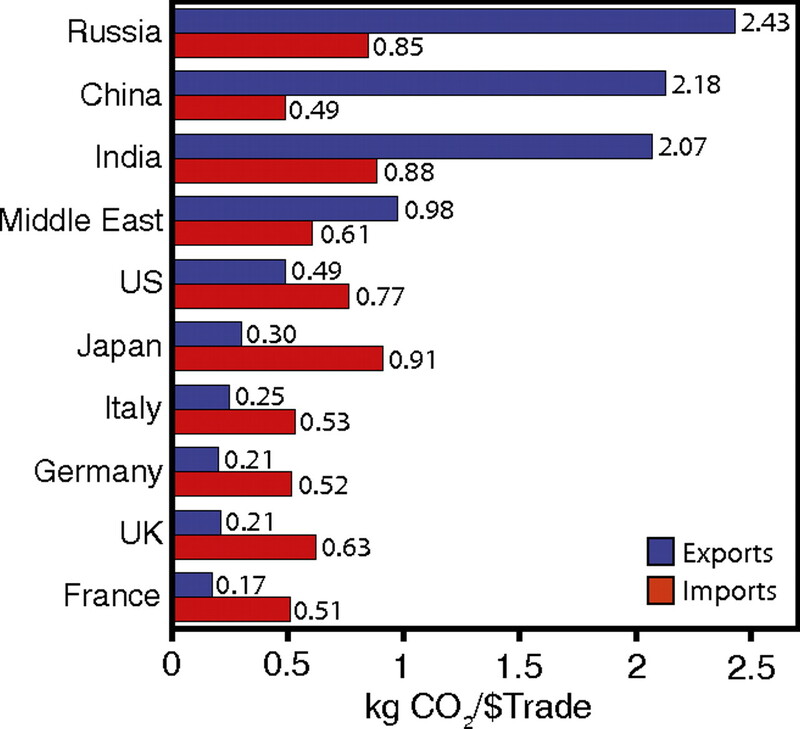 In the second figure below we see the carbon intensity (kgCO2 per $ of trade) for imports and exports across several countries. The goods exported from Russia, China, India, and the Middle East typically have a high carbon intensity, reflecting the fact that their exports are often manufactured goods. In contrast, we see that exports from the UK, France, Germany and Italy are low; this is likely to be the higher share of export of service-based exports relative to those produced from heavy industry. The chart below shows how production and consumption-based emissions have changed since 1990 across regions and countries. If a country&apos;s consumption-based emissions are higher than its production-based emissions then it is a net importer of CO2. If production-based emissions are higher, it is a net exporter. With an understanding of the link between CO2 and global temperatures, as well as knowledge of the sources of emissions, an obvious question arises: How much could we reduce our emissions by, and how much would it cost? The possible cost-benefit of taking global and regional action on climate change is often a major influencing factor on the effectiveness of mitigation agreements and measures. How we work out the potential costs of global climate change mitigation has been covered in an explainer post here. In more recent years, global concentrations of CO2 can be measured directly in the atmosphere using instrumentation sensor technology. The longest and most well-known records from direct CO2 measurement comes from the Mauna Loa Observatory (MLO) in Hawaii. The MLO has been measuring atmospheric composition since the 1950s, providing the clearest record of CO2 concentrations across the 20th and 21st century. To reconstruct long-term CO2 concentrations, we have to rely on a number of geological and chemical analogues which record changes in atmospheric composition through time. The process of ice-coring allows for the longest extension of historical CO2 records, extending back 800,000 years. The most famous ice core used for historical reconstructions is the Vostok Ice Core in Antarctica. This core extends back 420,000 years and covers four glacial-interglacial periods. Ice cores provide a preserved record of atmospheric compositions—with each layer representing a date further back in time. These can extend as deep at 3km. Ice cores preserve tiny bubbles of air which provide a snapshot of the atmospheric composition of a given period. Using chemical dating techniques (such as isotopic dating) researchers relate time periods to depths through an ice core. If Looking at the Vostok Ice Core, researchers can say that the section of core 500m deep was formed approximately 30,000 years ago. CO2 concentration sensors can then be used to measure the concentration in air bubbles at 500m depth—this was approximately 190 parts per million. Combining these two methods, researchers estimate that 30,000 years ago, the CO2 concentration was 190ppm. Repeating this process across a range of depths, the change through time in these concentrations can be reconstructed. Historical fossil fuel CO2 emissions can be reconstructed back to 1751 based on energy statistics. These reconstructions detail the production quantities of various forms of fossil fuels (coal, brown coal, peat and crude oil), which when combined with trade data on imports and exports, allow for national-level reconstructions of fossil fuel production and resultant CO2 emissions. More recent energy statistics are sourced from the UN Statistical Office, which compiles data from official national statistical publications and annual questionnaires. Data on cement production and gas flaring can also be sourced from UN data, supplemented by data from the US Department of Interior Geological Survey (USGS) and US Department of Energy Information Administration. A full description of data acquisition and original sources can be found at the Carbon Dioxide Information Analysis Center (CDIAC). As an example: how do we estimate Canada&apos;s CO2 emissions in 1900? Let&apos;s look at the steps involved in this estimation. Step 1: we gather industrial data on how much coal, brown coal, peat and crude oil Canada extracted in 1900. This tells us how much energy it could produce if it used all of this domestically. Step 2: we cannot assume that Canada only used fuels produced domestically—it might have imported some fuel, or exported it elsewhere. To find out how much Canada actually burned domestically, we therefore have to correct for this trade. If we take its domestic production (account for any fuel it stores as stocks), add any fuel it imported, and subtract any fuel it exported, we have an estimate of its net consumption in 1900. In order words, if we calculate: coal extraction - coal exported + coal imported - coal stored as stocks, we can estimate the amount of coal Canada burned in 1900. Step 3: converting energy produced to CO2 emissions. we know, based on the quality of coal, its carbon content and how much CO2 would be emitted for every kilogram burned (i.e. its emission factor). Multiplying the quantity of coal burned by its emission factor, we can estimate Canada&apos;s CO2 emissions from coal in 1900. Step 4: doing this calculation for all fuel types, we can calculate Canada&apos;s total emissions in 1900. There are two key ways uncertainties can be introduced: the reporting of energy consumption, and the assumption of emissions factors (i.e. the carbon content) used for fuel burning. Since energy consumption is strongly related to economic and trade figures (which are typically monitored closely), uncertainties are typically low for energy reporting. Uncertainty can be introduced in the assumptions nations make on the correct CO2 emission factor for certain fuel types. Data: CO2 emissions (also by fuel type), and data on trace gas emissions, aerosols, the carbon cycle, the Full Global Carbon Budget (1959-2013), land use and more. Geographical coverage: Global, regional, national, subnational (for some) and globally gridded (1°x1°; since 1751). CDIAC is the climate-change data and information analysis center of the U.S. Department of Energy (DOE). The Historical Carbon Dioxide Record from the Vostok Ice Core is available here - it covers the period 417,160 - 2,342 years BP. The Atmospheric Carbon Dioxide Record from Mauna Loa is available here - it goes back to 1958. The Clio Infra Project is also using CDIAC data. The data is available for download here. [Field, C.B., V.R. Barros, D.J. Dokken, K.J. Mach, M.D. Mastrandrea, T.E. Bilir, M. Chatterjee, K.L. Ebi, Y.O. Estrada, R.C. Genova, B. Girma, E.S. Kissel, A.N. Levy, S. MacCracken, P.R. Mastrandrea, and L.L.White (eds.)]. Cambridge University Press, Cambridge, United Kingdom and New York, NY, USA, 1132 pp. Available online. Delworth, T. L., Zeng, F., Vecchi, G. A., Yang, X., Zhang, L., & Zhang, R. (2016). The North Atlantic Oscillation as a driver of rapid climate change in the Northern Hemisphere. Nature Geoscience, 9(7), 509-512. Available online. Ciais, P., C. Sabine, G. Bala, L. Bopp, V. Brovkin, J. Canadell, A. Chhabra, R. DeFries, J. Galloway, M. Heimann, C. Jones, C. Le Quéré, R.B. Myneni, S. Piao and P. Thornton, 2013: Carbon and Other Biogeochemical Cycles. In: Climate Change 2013: The Physical Science Basis. Contribution of Working Group I to the Fifth Assessment Report of the Intergovernmental Panel on Climate Change [Stocker, T.F., D. Qin, G.-K. Plattner, M. Tignor, S.K. Allen, J. Boschung, A. Nauels, Y. Xia, V. Bex and P.M. Midgley (eds.)]. Cambridge University Press, Cambridge, United Kingdom and New York, NY, USA. Available online. Intergovernmental Panel on Climate Change [Core Writing Team, R.K. Pachauri and L.A. Meyer (eds.)]. IPCC, Geneva, Switzerland, 151 pp. Available online. UN FAO. Emissions by sector - dataset information. Available online. IPCC, 2014: Summary for Policymakers. In: Climate Change 2014: Mitigation of Climate Change. Contribution of Working Group III to the Fifth Assessment Report of the Intergovernmental Panel on Climate Change [Edenhofer, O., R. Pichs-Madruga, Y. Sokona, E. Farahani, S. Kadner, K. Seyboth, A. Adler, I. Baum, S. Brunner, P. Eickemeier, B. Kriemann, J. Savolainen, S. Schlömer, C. von Stechow, T. Zwickel and J.C. Minx (eds.)]. Cambridge University Press, Cambridge, United Kingdom and New York, NY, USA. Available at: IPCC AR5 Report. Note that these figures are for total greenhouse gases (not just CO2), so nitrous oxide and methane production also play an important role. The application of agricultural inputs, such as nitrogen fertilizer, is a key contributor to nitrous oxide emissions (a potent greenhouse gas). Jonathan A. Foley, Navin Ramankutty, Kate A. Brauman, Emily S. Cassidy, James S. Gerber, Matt Johnston, Nathaniel D. Mueller, Christine O’Connell, Deepak K. Ray, Paul C. West, Christian Balzer, Elena M. Bennett, Stephen R. Carpenter, Jason Hill, Chad Monfreda, Stephen Polasky, Johan Rockström, John Sheehan, Stefan Siebert, David Tilman & David P. M. Zaks. (2011) Solutions for a cultivated planet. Available online. Meat production is generally a resource-intensive process, requiring large land, water and feed ressources. Tilman, D., & Clark, M. (2014). Global diets link environmental sustainability and human health. Nature, 515(7528), 518-522. Available online. Chancel, L. and T. Piketty (2015), "Carbon and inequality: From Kyoto to Paris. Trends in the global inequality of carbon emissions (1998-2013) & Prospects for an equitable adaptation fund", Paris School of Economics, Paris. Available at: Chancel and Piketty, 2015. Note that data of intensity based on collective global/national figures works out the same as when normalised to per capita intensities. This is because in the calculation of per capita figures, both CO2 emissions and GDP are divided by population size. This means they effectively cancel each other out, giving the same result. Note that there is an important distinction here between traded goods and traded fuels. Fuels which are traded, then ultimately burned (with CO2 emissions as a result) within a country's boundaries are included in production-based accounts. In fact, this trade data on fuel imports and exports is an essential component in reconstructing historical emissions. Production-based accounts, however, do not account for non-fuel traded goods or products. In this case, we assume that the energy necessary to produce these products was consumed within the exporting country's boundaries, and therefore recorded in its reported CO2 emissions. For example, if the UK imports coal from China then burns it for energy production, the CO2 from combustion will have been emitted within the UK's boundaries and it will therefore be accounted as emissions of the UK. If the UK imports aluminium from China, the energy and emissions necessary to mine this aluminium would have already been emitted within China's boundaries; in this case the emissions are attributed to China. (Updated to 2014) Peters, GP, Minx, JC, Weber, CL and Edenhofer, O 2011. Growth in emission transfers via international trade from 1990 to 2008. Proceedings of the National Academy of Sciences 108, 8903-8908. Available online. IPCC Good Practice Guidance and Uncertainty Management in National Greenhouse Gas Inventories. Available online. Liu, Z., Guan, D., Wei, W., Davis, S. J., Ciais, P., Bai, J., ... & Andres, R. J. (2015). Reduced carbon emission estimates from fossil fuel combustion and cement production in China. Nature, 524(7565), 335-338. Available online. Macknick, J. (2011). Energy and CO2 emission data uncertainties. Carbon Management, 2(2), 189-205. Available online.